Willem Janszoon (or Jansz.) Blaeu (1571 - 1638) was the founder of a large publishing firm that became famous in the field of cartography under the name Blaeu. The Blaeu family has its origin on the island of Wieringen, where around 1490, Willem Jacobsz., alias Blauwe Willem, the grandfather of Willem Jansz. Blaeu was born. From the marriage of Willem Jacobsz. and Anna Jansd. came six children. The son Jan Willemsz. (1527- before 1589) was the father of Willem Jansz Blaeu, who continued the family tradition by practising the trade of herring packer. In his second marrariage with Stijntge. Willem Jansz Blaeu was born in 1571. We do not know wether he was born at Alkmaar or Uitgeest. At an early age he went to Amsterdam in order to learn the hearring trade. But Willem Jansz. Blaeu did not like this work very much; as he was more inclined to mathematics. It must have been during this period that he met Adriaan Anthonisz (1541- 1620), surveyor, astronomer, mathematician, military engineer and fortifications superintendent of the Dutch Republic. This enthusiast for the liberal arts was the father of the better-known Adriaan Metius, who was also born in 1571 and would later become Blaeu’s scientific adviser. Blaeu moved to Amsterdam at the age of 23 to learn the ins and outs of the herring trade from his family. Blaeu lived for two years on the Island of Hven, over the winter of 1595/1596 at Tycho Brahe's observatory in Urienborg. The celebrated Danish astronomer Tycho Brahe (1546-1601), demanded a high standard of his pupils. Some were invited by him, others he undoubtedly took on special recommendation. We may therefore presume that the young Blaeu had reached a high standard of education and technical skill, since he was considered worthy to become a pupil of the great astronomer. After his return to the Netherlands he applied himself to astronomy for several years in the city of Alkmaar. Very little is known about his stay there, but it was where he married Marretie or Maertgen Cornelisdr of Uitgeest, probably in 1597. It was there, too, that his eldest son Joan was born. On 21 February 1598 Blaeu observed an eclipse of the moon from Alkmaar that was simultaneously observed by Tycho Brahe in Wandsbeck near Hamburg. The purpose of their observations was to determine the difference in longitude between the two places. While in Alkmaar he made a celestial globe 34 cm in diameter for Adriaan Anthonisz that was based on Tycho Brahe’s new but as yet unpublished star catalogue. The globe was published in 1597/1598 and was masterfully engraved by Jan Saenredam, a pupil of Hendrick Goltzius and father of Pieter Jansz Saenredam, the famous painter of church interiors. The production of globes was Blaeu’s main activity at the start of his career, and in order to set himself apart from the many others called Willem Jansz he dubbed himself ‘Willem Jansz Globi’ or ‘Geloobmaker’. Blaeu followed the tradition of making globes in pairs: a terrestrial and a celestial one. Willem Jansz moved to Amsterdam with his family around 1598/1599, and opened a shop selling celestial and terrestrial globes, maps and astronomical instruments. The great voyages of discovery advanced the science of navigation, and there was a pressing need for astronomical instruments to determine the position of ships at sea. Blaeu had enjoyed an excellent training as an instrument maker under Tycho Brahe. He shows considerable interest in maritime instruments in his sea atlases, and illustrates or reproduces them by means of movable diagrams. In 1605 he moved to new premises on Damrak, where most of the Amsterdam booksellers and mapmakers had clustered at that time. The building was called In de Vergulde Sonnewyser (In the Gilded Sundial) and here he also set up a printing shop and publishing house. His first publications were in the fields of cartography and navigation, and by 1608 he had already published a fine map of the world and a popular marine atlas. His early works include a globe of 1599, maps of European countries and a world map in 1604-1608. Blaeu’s early interest in navigation led to his first pilot guide, which was called the Nieuw graetbouck. He occupies an important position in the history of early Dutch pilot guides. His famous predecessor for the description of eastern, western and northern navigation was Lucas Jansz Waghenaer. Blaeu issued two pilot guides: Het licht der Zee-vaert (first edition 1609), which firmly established his reputation as a maritime cartographer, and Zeespiegel (first edition 1623), both of which were reprinted several times. The voyages of discovery in the fifteenth and sixteenth century created an insatiable interest in cartography. They also advanced the science of navigation, and there was a pressing need for astronomical instruments to determine the position of ships at sea. The newly discovered territories offered opportunities for trade, and it was not only essential to know how to reach them but also how to return home safely again. Knowledge increased with every voyage, and maps consequently became more and more accurate. The unfolding of new opportunities increased the demand for good maps. In addition to charts used specifically for navigation, growing numbers of people became interested in maps. They wanted to satisfy their curiosity about new countries, even if only on paper. Maps were also used to advertise one’s status, to promote a better understanding of history or politics, or to take the place of paintings. Willem Jansz was not the only publisher of maps and globes in Amsterdam. When he set up his business, Cornelis Claesz (1546/47-1609) and Jodocus Hondius the Elder (1563-1612), both originally from the southern Netherlands, had already made a name for themselves. 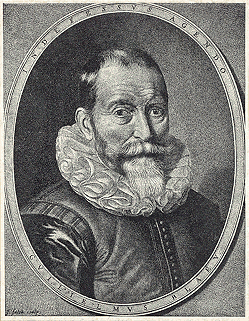 After Claesz’s death, Willem Jansz succeeded in acquiring much of his estate, which strengthened his position as a map publisher. However, he had fierce competition from his neighbour Jan Jansz, or Johannes Janssonius, another mapmaker, bookseller and publisher who took the premises next door to Blaeu on Damrak. Willem Jansz Latinised his name to (Guilelmus) Janssonius, in accordance with the general custom, and this caused much confusion and was later abused by Jan Jansz. Willem Jansz decided to change his name and chose that of his grandfather, ‘Blauwe Willem’ (Blue William) as his surname in 1621. From then on, he called himself Willem (Jansz) Blaeu and sometimes added the Latinised form ‘Caesius’ (bluish-grey) to his imprints. At his start Blaeu published several separate-sheet maps in folio format. Many have figure borders. All are extremely rare. A sample is following map of Germany published in 1609. Germanae post omnes in hac forma editiones exactissima locupletissimaq. descriptio. Along the top is a border representing the seven Electors and the Emperor on his throne. Read more or contact us if you want to buy this map. Willem Blaeu's wall maps are considered to be among the most influential and artistically virtuous masterpieces of the great era of baroque cartography. The publication of the first set of his wall maps in 1608 was responsible for initiating his ascendancy to the pre-eminent position in the highly competitive global map market. 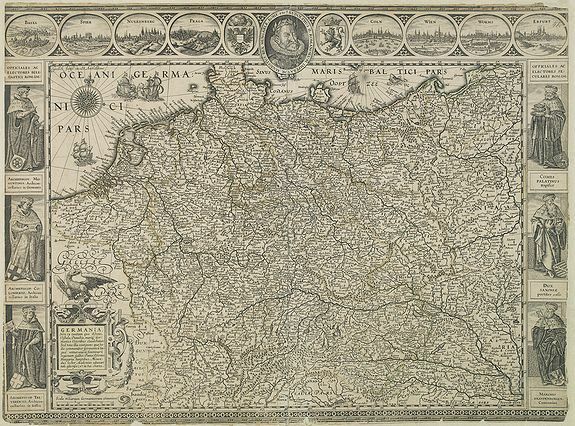 Blaeu published several wall maps, printed on parchment or paper. All editions of Blaeu wall maps are extreme rarities. The one we are offering here is the only original edition published by Blaeu or the publishing house Blaeu. The handfull of wall maps offered for sale in the last 25 years are all later editions by Goos, or Italian copies. Only eight copies copies, all in instututions, are known to Prof. G. Schilder. The use of maps as wall hangings in contemporary Dutch houses went beyond the desire for cartographic information. Maps were also used to express status, to promote a better understanding of history or politics or to take the place of paintings. Maps were also used to express status, to promote a better understanding of history or politics or to take the place of paintings. At the time Vermeer painted his works, Amsterdam was the world centre of map-making. Among the most majestic productions were the wall maps of Willem Blaeu. The pride of place that wall maps claimed in Dutch homes is most eloquently presented in a half-dozen or so of the exquisite paintings by Vermeer, as well as in such contemporary scenes as Pieter de Hooch's A Woman Drinking with Two Men (1658) in the National Gallery. These views of everyday life bear witness to an almost totemic cult of maps. A fine example of a map on vellum is this Pascaarte van alle de Zécuften van EUROPA. Nieulycx befchreven door Willem Ianfs. Blaw. Men vintfe te coop tot Amsterdam, Op't Water indevergulde Sonnewÿser. The map was first published between 1621 and before 1650. The map is in a first state of two. 687 x 868 mm. The title and imprint appear in a cartouche, crowned by the printer's mark of Willem Jansz Blaeu [INDEFESSVS AGENDO], at the center of the lower border. The map is very rare and suprisingly, no example on vellum is kept in a Dutch Institution. Interestingly, Johannes Vermeer used this map in his painting "The geographer" (1669), now in Städel Museum, Frankfurt, Germany. That the chart was published in 1621 was no coincidence; hence, the Dutch "West India Company" was founded in that year. The W.I.C. ships bound for New Amsterdam (later becoming New York) and Brazil, but also the V.O.C. ships bound for Batavia (Djakarta), China and Japan (Nagasaki) where in need of accurate charts. Blaeu published in 1621 also his West Indische Paskaert. Blaeu devoted his attention to the needs of navigation from an early stage of his career. His first publication in this field was his Nieuw graetbouck, and no copy has been found to this day. In the history of early Dutch pilot guides Blaeu's work takes a very important place. His famous predecessor for the description of the Eastern, Western and Northern navigation was Lucas Jansz. Waghenaer. Blaeu issued two pilot guides, named Het licht der Zee-vaert (first edition 1609) and Zeespiegel (first edition 1623). The works were republished several times. In 1621 Janssonius published a plagiarised copy of Blaeu’s pilot guide Het licht der Zee-vaert. He was able to do so with impunity because Blaeu’s copyright had expired. Blaeu then decided to compete with his competitor Janssonius and his brother-in-law Henricus Hondius(1597 - 1651) in the field of atlas production, in which the latter had a monopoly with the Mercator/Hondius/Janssonius atlases. Blaeu's publication of land atlases came at a late date. From early on Willem Jansz. Blaeu aimed of publishing an atlas to compete with the Hondius-Jansson Atlas. By 1630, he had published at least 17 folio size maps. In 1630 Blaeu was able to realize his plan soon after he had acquired 37 copper plates of the atlas maps by Jodocus Hondius from Jodocus Hondius II. He added these to his own collection and published the Atlantis Appendix, which contained 60 maps. This publication sparked off a new trend in Amsterdam atlas production that was characterised by competition and an increased output of maps. Blaeu then began planning a major atlas that would include the most up-to-date maps of the entire world. In 1633, partly due to aggressive competition by Hondius-Janssonius, Blaeu announced his intention to publish a new 'Novus Atlas' in two volumes. According to Gunter Schilder, correspondance between Blaeu and Wilhelm Schickhard, indicated that Blaeu intended to complete the atlas that same year. Blaeu's intention to publish a new 'International edition' of a world atlas is mentioned on February 11th, 1634 in an Amsterdam newspaper. "At Amsterdam is now being printed by Willem Jansz Blaeu the large book of maps, the Atlas, in four languages: Latin, French, German and Dutch. The one in German will appear about easter, the ones in Dutch and French in the month of May, or early June at the latest, and the one in Latin shortly thereafter. All editions on very fine paper, completely renewed with newly engraved copperplates and new, comprehensive descriptions." Despite the fact that Blaeu's newspaper announcement early in 1634 stated that the atlas was 'now beining printed', only the German edition of the atlas was completed in that year, though not in its final form. We offer the following antique maps published in this rare 1634 Atlas by the publishing house of Willem and Joan Blaeu. The other editions all have a 1635 publication date. The atlas was published in German (10th March 1634), Latin (13th April 1635), Dutch (22th April 1635), French (1st July 1635). Blaeu's plans were ambitious. In the preface to the German edition of 1636, he writes : "Our intention is to describe the entire world, that is the heavens and the earth, in several volumes like these two, of which two more of the earth will shortly follow". But Willem Jansz. Blaeu did not live to see the other two volumes issued which he had prepared. These two volumes appeared in 1640 (Italy) and 1645 (England). In the sixteenth century the art of making instruments flourished especially in the Southern Netherlands. As a result of the great discoveries navigation advanced, and there was a real need for astronomical instruments to determinate positions. Blaeu had enjoyed an excellent training as an instrument maker under Tycho Brahe. In his sea atlases, he shows considerable interest in the instruments used at sea, and illustrates or reproduces them by means of movable diagrams. Only a few instruments constructed by him are still in existence. The production of globes was also an important and lucrative part of the business. In the second half of the seventeenth century, after buying up the copper plates of all the rival firms, the Blaeus became the sole producers of globes in Amsterdam. Blaeu produced his globes in pairs : a terrestrial and a celestial globe. In 1599, Blaeu published his first terrestrial globe with a diameter of 34 cm. In 1602 Blaeu produced a small 9 inch / 23,5 cm globe, which he dedicated to the States of Holland, Zeeland and West-Friesland. Blaeu's 68 cm globes were made in response to the 53 cm pair issued by the Hondius firm in 1613. Their preparation was announced in 1614, and when finished in 1616, were presented to the States General, who awarded an honorarium of 50 guilders. They would remain the largest globes in production for over 70 years, until Vincenzo Maria Coronelli (1650-1717) issued his 110 cm pair in 1688. Read more or contact us if you want to buy a pair of Blaeu's 9 inch / 23,5 cm globes. In addition to his activities as a publisher, Blaeu continued his scientific pursuits. He used his findings to improve his maps and guides, so each discipline strengthened the other. His expertise won official recognition when he was appointed official cartographer and examiner of navigating officers to the Amsterdam chamber of the Dutch East India Company (VOC) in 1633. It was a period when Amsterdam was one of the wealthiest trading cities in Europe, and a centre for banking and the diamond trade. The VOC (1602-1798) contributed significantly to the wealth and prosperity of the Dutch Republic, and Blaeu’s prestigious appointment firmly established his reputation within the highly competitive world of Dutch mapmakers. As official cartographer of the VOC, as well as of the Dutch West India Company (WIC; 1621-1792), Blaeu had the finest craftsmen at his disposal, and the quality of his own work continued to improve. The artists drawing and colouring the maps usually worked on the premises, which meant that the quality of their work was under constant supervision. Willem was appointed cartographer to the Dutch East India Company, Vereenighde Oostindische Compagnie (VOC) in 1633. During this period, Amsterdam was one of the wealthiest trading cities in Europe and a center for banking and the diamond trade. 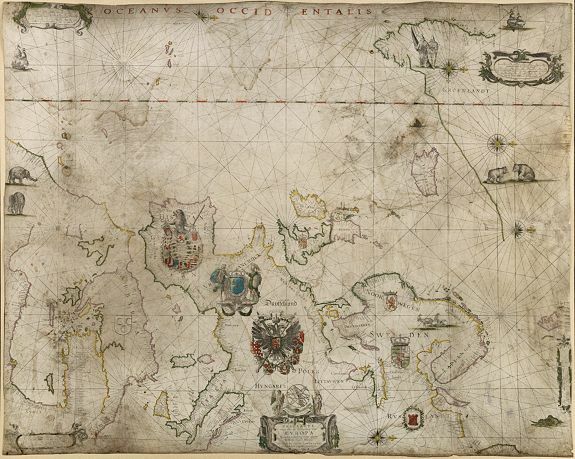 The VOC contributed significantly to the wealth and prosperity of the United Netherlands, and Blaeu's prestigious appointment firmly established his reputation within the highly competitive field of Dutch map makers. He became the appointed cartographer for the West Indian Company (W.I.C. ), for whom he made his West Indische Pascaert. The largest map printed on vellum at the time. The French 1638 edition of the Theatrum was the last atlas published in Willem's life time. After his death in 1638, Willem Jansz was succeeded by his sons Joan (1598/1599-1673) and Cornelius (c. 1610-1642) Blaeu, who continued and expanded their father’s ambitious plans. Joan inherited his father’s VOC duties, which included making manuscript charts and compiling sailing directions for navigators. He had access to a vast amount of up-to-date information, particularly about parts of the world dominated by the Dutch. Although much of this information was incorporated into his manuscript charts and large wall maps, it seems he was unable to take advantage of his privileged position with the VOC for his own publications, with the result that many of the maps in his great atlases contain less accurate information than that of his competitors. Joan continued the business alone after Cornelis’s death in 1644, and established his own reputation as a great mapmaker. The successive acquisition of the copper plates of competing globe making firms in Amsterdam (those of the Hondius family in particular) gave Joan a monopoly in by the middle of the seventeenth century. Joan completed his father’s grand project in 1655 with the sixth and final volume of the Atlas novus. Joan succeeded in producing the most voluminous world atlas of all time when the magnificent Atlas maior saw the light of day in 1662. The final, eleventh volume of the Spanish edition was in the press when, on 28 February 1672, the printing shop was destroyed by fire, a blow from which the famous Blaeu publishing house never recovered. Joan’s sons Joan II (1650-1712) and Pieter (1637-1706) were the third generation to run the firm before it closed down in 1706. The printing shop had already been sold by action 1695 at which a large number of copper plates went to Frederik de Wit who began to publish a town atlas of the Netherlands. Click here to see samples of maps by the Blaeu family. - Koeman's Atlantes Neerlandici by Peter van der Krogt.